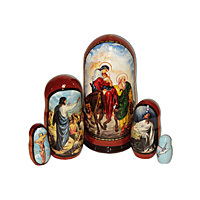 Wooden matryoshka nesting dolls are the ultimate traditional Russian souvenirs. Over the years, they acquired many names, including babushka, stacking dolls, and many of their spelling variations. 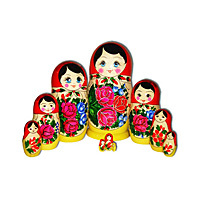 First created in 1890 by a Russian craftsman, matryoshka dolls were subsequently made primarily in Sergiyev Posad, Semyonov, and Polkhovsky Maidan giving city names to the respective styles. Dawn of the Soviet Union proved to be a fertile ground for talented artists testing out new designs. 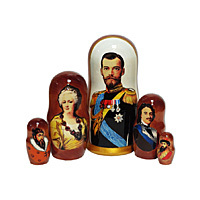 As a result, nesting dolls featuring communist leaders appeared on the market. That would later include political figures of the new Russian state and members of the Imperial family. Nowadays, design variations are endless. Here you will find classic style options, animals, cartoon characters, religious motifs, and country leaders. Price of a set is determined by complexity of artwork and number of pieces, which range from just 3 up to 30. Treat yourself to an authentic hand made product or buy as truly original gifts for family and friends.